Welcome to Amsterdam! Ramón Mossel Expat Services is founded on the promise to ensure expats a great and seamless purchase or rental of a property in Amsterdam. In a country that is not your own, buying or renting a property can be overwhelming. We fully understand the challenges you face. One of our Expat Services team members were once in your shoes, having moved from abroad to the Netherlands themselves. Thanks to our large market share in the Amsterdam housing market we are able to inform you first about new properties. Purchasing or renting a property in Amsterdam and its surroundings is a decision you want to take wholeheartedly and well thought out. We firmly believe that you benefit most from a partner that listens to your needs, truly understands your wishes and who will take care of all hassle and uncertainties. Ramón Mossel Expat Services would love to be this partner for you, so you can fully focus on visualizing your new home in Amsterdam. We are here to help you to get through all STEPS of the purchase or renting process. 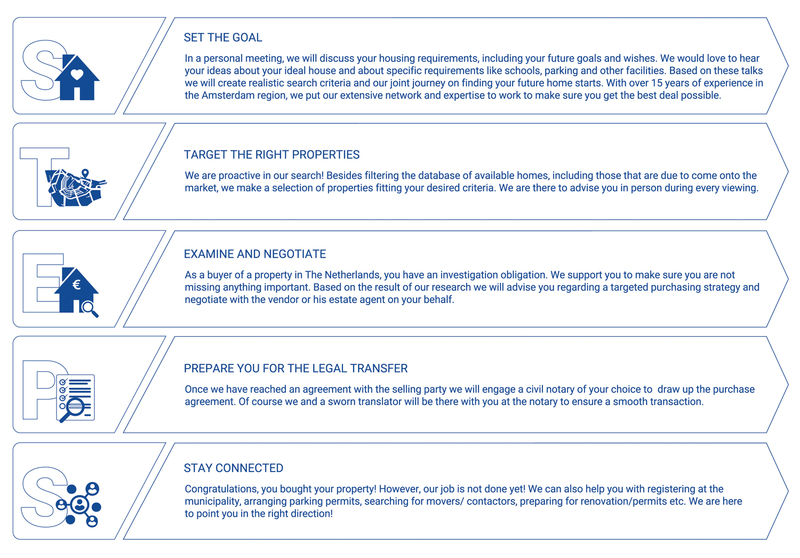 Please find below a quick guide about how we help you buying a house in The Netherlands.